This article originally appeared in "Skywings" magazine, June 1997. Silver medallist in the 1995 FAI European Paramotor Championships, Michel Carnet is the Chief Flying Instructor of the Sky Systems Flying Schools in Brighton. Michel tries to clarify where paramotoring sits within the foot launch aviation world, and answers some of the most common questions! Everyone is talking about paramotoring. What is so special about it? Another hype? One thing is for sure, the "aeroplane in the boot of the car" is catching the public's imagination. There is no doubt that a paramotor is the minimum powered aircraft par excellence. Only the rocketeer's backpack could beat it! The success of paragliding is mainly due to slow flying characteristics and the absence of rigid parts. The air never hurts, only the earth (or contact with it) can hurt. So the ability to land slowly and safely anywhere with no airframe to bend is priceless. In aviation simplicity is safety, and remember: "What you haven't got, weighs nothing and cannot break down". Foot-launching is a great asset. It is all terrain aviation: Pebbled or sandy beaches, ploughed or cropped fields, snow covered or flooded land and the roofs of royal palaces are all suitable surfaces for paramotor operation. The short turning radius, combined with slow flying speed makes even a cricket pitch size field surrounded by trees a safe place to fly from. For the existing paraglider pilot, it is a practical add-on means of self launching: no need to drive miles to a crowded hill, chasing the wind or lift. The main advantage is that he or she already possesses the wing and knows how to fly it. Of course it is not the real thing! Nothing can beat paragliding on the right day in the right place. Petrol smells, oil sticks, noise is a pain and the ozone layer is thinning. Saying that, driving 50 miles to a hill and burning 4 gallons of petrol getting there is surely worse than using a pint of 50:1 mixture around the corner for half an hour of thermal seeking on your airborne lawn mower. The other useful side of paramotoring for purist paraglider pilots is the possibility to experiment with different conditions and locations: sea breezes, wave, over water or above clouds, etc. Flying onto an unlaunchable hill is great. Retrieving oneself is also possible. Self sustaining and self launching sailplanes exist for exactly these reasons. Ridge soaring close to the hill is a buzz. A paramotor allows you to do the same thing over flat ground. Chasing foxes and rabbits, following rivers, slaloming through trees, dragging a foot through powdery snow or long dewy grass is fantastic. Where to fly a paramotor? The main drawback with all powered flying is the noise pollution, not so much for your ears, but vis-a-vis the neighbours. It is essential not to spoil existing harmonious relationships which BHPA clubs & schools have enjoyed (or struggled to keep) so far, by the nature of its environmental friendliness. Consideration when choosing where you take off from and who you over-fly is critical for the long term survival of paramotoring. It is easy for an individual to approach a land owner for permission to fly in small numbers. Paramotors should operate in a diluted format throughout the country and avoid overcrowded repeated buzzing around. The first paramotors appeared in France and Germany in the late eighties. They used heavy, thirsty twin or 3-cylinder engines with direct drives. The 30-plus kg weight and unbearable noise made them unattractive. With the increase in performance which the recent generations of paragliders have at their disposal, less power is needed so smaller lighter one-cylinder 2-stroke engines can be used, resulting in weight reductions to under 20 Kg. Reduction drives allow larger, slower spinning propellers (or more blades) to be used, thus reducing noise and increasing thrust, but unfortunately adding a little weight. The propeller's design is important. Wood is the most common material, while plastic, composite and aluminium may also be used. A multitude of forms and tip shapes are used with various degrees of success. In any case a balanced propeller is essential to avoid vibrations and damage to the reduction assembly. Most paramotors used to be cantilevered, and some still are. This means they have rigid suspension arms from which the pilot hangs, forward of the paraglider attachments. This compensates for the weight of the engine. The advantage of this system is to relieve the pilot of the weight of the paramotor once airborne. The drawbacks are a higher paraglider hang point than when paragliding, preventing you from reaching big ears or sometimes the brakes and, most critically, a more difficult inflation. Some paramotors simply hang on the back of a paraglider harness, with the pilot carrying the extra weight on the ground as well as when airborne: short flight guaranteed! Various systems have been tried to find a compromise between a low paraglider hang point and suspension of the paramotor, such as under-arm cantilevers. However, the higher centre of gravity may decrease the pendular stability and amplify the torque effect: nicer if underpowered. A very popular system, now used by various manufacturers, is to plug the paramotor onto rigid tubes which are attached to each side of the harness at chest level, with shoulder attachments to stop the paramotor swinging back. This system allows good access to the risers and offers comfort on launch and when airborne. 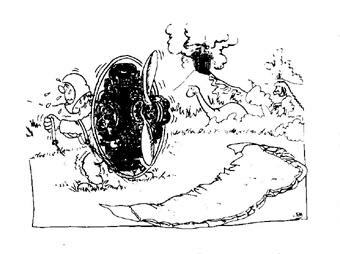 Early paramotors had protective frames in front of the pilot to prevent being crushed in the event of a forward crash. In practice, people tend to fall backward, if at all, so those protective frames have almost disappeared. The cage prevents the suspension lines getting caught in the propeller while launching or in the event of a canopy collapse. The netting is only needed in front of the cage, as the blown air behind keeps the lines at bay. A smooth cage periphery allows the lines to slide upwards easily for successful canopy inflation. The torque effect: Most paramotors use counter-clockwise (looking ahead) rotating propellers. Each propeller blade creates lift (thrust) as well as drag. The drag element also makes the paramotor want to rotate around the propeller. This means that as you open the throttle the paramotor will rotate clockwise resulting in lowering the right risers, inducing a right hand turn (similar to a weight-shift harness turn). 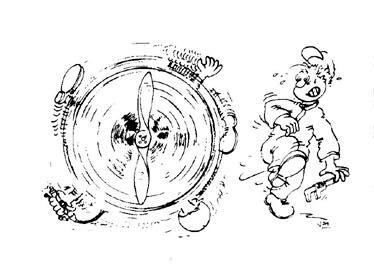 The larger and less efficient the propeller, the greater the torque effect. A consequence of the torque effect is that you may have to apply some left hand brake to fly in a straight line, and you may have to accept to gently turn right while on a full power climb. Obviously a clockwise rotating propeller will have the opposite effect. The hand throttle normally includes a cut off switch and the electric start button, if fitted. A left hand throttle is preferable for two reasons: Your right hand is free to take pictures (there are no left hand cameras!) and your left hand may be busy anyway on the brakes to compensate for torque. Mouth-throttles are sometimes used, and incorporate a mercury switch to cut off the engine when the throttle is dropped. An electric start has a lot of advantages: It's nice to be able to switch off in a thermal and restart later. The ability to start the engine when standing up ready to go is also very useful. Without it, if you are on your own, you need to hand start the engine on the ground (with the paramotor not blowing the paraglider away), sit in the harness, strap yourself in, stand up, sort out brakes and risers, then go. Not as easy as it may sound. Most engines have a minimum electrical system - just enough to provide a spark. Electric start batteries are typically Ni-Cads, charged from the mains. Some manufacturers may claim that their paramotor can be hand/foot started in the air. Although it may be possible to do in ideal conditions, in practice it doesn't often work and can even be dangerous if back-firing. Various types of de-compressors help with the starting of engines, manual or automatic. Some paramotors have centrifugal clutches, meaning that only when you apply power will the propeller rotate. The idea is that a light flexible cage can be used, allowing the odd crash without bending the cage and exploding the propeller. However, a flexible cage can be tricky. When leaning forward too much on inflation against the suspension lines, a flexible cage could deform back and come in contact with the propeller. A full frontal deflation under power is also the ultimate test for the cage. The most common crash on a paramotor is when the pilot lifts his or her legs too early on take-off, resulting with a bum landing with the full revving propeller digging trenches. In this instance a clutch cannot help. Integral moulded petrol tanks have the advantage of high capacity and space/weight saving. 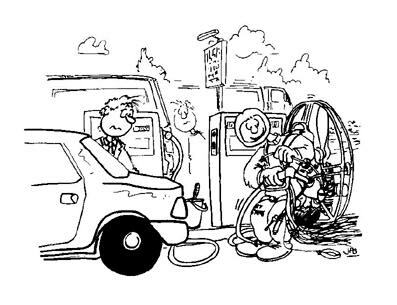 The ability to close the venting of the petrol tank while transporting it in the car is essential. Fuel economy is very important. Not just for the running cost but for the fact that the amount of fuel needed for a long flight is extra weight on launch (10 litres = 7 kg). Air filters are commonly used, sometimes with air intake mufflers which also reduce noise. The maximum glide ratio (lift/drag) of your glider is the same ratio of weight/thrust needed to fly level. Remember the cage will reduce your paraglider's maximum glide ratio. So a typical total flying weight of 120 kg with a 6:1 paraglider requires 20 kg of thrust to maintain flight. Obviously temperature, pressure, altitude, humidity and optimistic manufacturers' figures affect this theoretical equation. Manufacturers will certainly carry on developing the impossible compromise of weight/power/cost/fuel economy to the limit. However it is prudent to settle for a well-proven, well-tested system. Some manufacturers will experiment with new ideas or components directly into their production lines, without a test program, waiting for the phone to ring to see which idea works and which doesn't. Most paragliders are suitable for paramotoring, with a few notable exceptions. However, a canopy which is easy to inflate is essential. The biggest misconception is that you need a larger paraglider. Traditionally, paragliders have a very narrow certified weight range as sink rate is dictated by canopy size. AFNOR load tests allow a weight range with a ratio of 1.3 max/min, which would for instance be: 100 to 130 kg all up weight. The glider must then resist 8G, 8 x 130 kg = 1040 kg. Often the tested paragliders go well over the required load. If your paramotor took you 20 kg over the weight limit, you would have come down to 7G giving plenty of reserve. When winching with a 100 kg pull , you could come down to 4.5G, and yet winching is accepted as safe on these terms. All these theoretical measurements apply to a brand new canopy. Ageing materials must have an effect on overall strength. Another argument to demonstrate how one can fly safely well over the recommended weight range: some manufacturers use extrapolation between the various canopy sizes, meaning the larger size is an exact model of the smaller size but with every part larger, as opposed to adding more cells. With extrapolated models, manufacturers use the same number of cells and lines of same thickness, whichever the size. Like in all powered activities, speed is everything and a smaller canopy will not only facilitate ground handling but also increase ground speed and range. In practise, the paraglider which you use for paragliding is the one you should use for paramotoring. Normal AFNOR certification does not cover power effects and therefore one must accept some degree of pioneering when paramotoring. The main problem is that the thrust is applied to the pilot and not the wing. When a paraglider is designed, the drag given by the pilot is unfortunately affecting the overall geometry and trim. If you could magically remove the drag of the pilot the canopy would hang back and would need retrimming. In effect, this is what happens when you apply some thrust, you cancel that drag. So when climbing, not only is your attitude (angle canopy/horizon) greater but so is your angle of attack. Furthermore, the line of thrust being angled upwards, your apparent weight (resultant weight & thrust) will decrease, thus unloading the wing while the weight of the canopy remains the same! This also contributes to an increase of the angle of attack. One may experience some oscillations or Dutch Roll. The use of speed trims or stirrup when under full power is useful to bring the canopy back to a correct trim. With the engine switched off, the extra drag of the cage does the opposite, i.e. allowing the canopy forward to a faster trim. The torque effect is the first thing one notices. The canopy may want to turn right (counterclockwise propeller) as if weight shifting. Right brake must be applied with moderation or else you will perform a wingover. Left brake must also be applied with moderation to prevent a spin. An easy answer to unpleasant power effects is to simply reduce power! Some simple devices can reduce or eliminate the torque effects such as a diagonal adjustable cross-braced strap, a longer carabiner to the right riser or asymmetrical speed trims. Noise is obviously a problem not only for your neighbour 1 mile away but your own ear drums a foot away. Ear defenders are essential. The high revving propeller carries an obvious amount of danger not only to you but also to the public. If the propeller breaks while airborne (for instance following damage on launch) there is a risk of structural damage to the wing. Extra line from the brake handle must be tied or cut to avoid hitting the propeller when forward inflating. After landing, one must resist the temptation of carrying the canopy over one's shoulder if the hot exhaust is on that side! Finally, a paramotor allows you to fly through the wake of your own wing and propeller with possible unpleasant bumps and a horrible exhaust smell.